Craving doughnuts? Think twice before eating one. 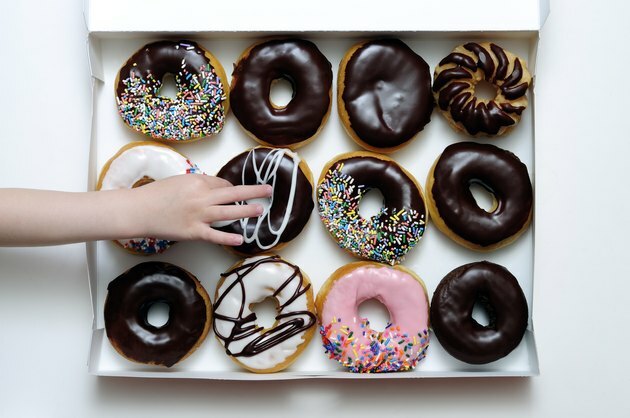 There are approximately 303 calories in a large chocolate-covered doughnut. Some brands, such as the popular Winchell’s Fancy Horseshoe, boast up to 700 calories and 27 grams of sugar per serving. Imagine how long you'd have to exercise to burn those extra calories! And this isn't the only reason why doughnuts are among some of the worst foods to eat. From children to grownups, everyone loves doughnuts. They're fluffy, sweet and inexpensive. What most people don't realize is that doughnuts are a calorie bomb loaded with sugar. Take Dunkin' Donuts Chocolate Frosted Cake Donut, for example. This sweet treat provides 20 grams of sugar and 350 calories per serving. The Old Fashioned Doughnut from Top Pot boasts 36 grams of sugar and 480 calories per serving. If you're a fan of Krispy Kreme, keep in mind that the popular Double Dark Chocolate Doughnut comes packed with 370 calories and 26 grams of sugar. Read more: How Many Calories Does a Doughnut Have? According to the U.S. Dietary Guidelines, added sugars should not exceed more than 10 percent of your daily calorie intake. There are 387 calories in 100 grams of sugar. Eating just one doughnut is unlikely to cause any harm. However, unless that doughnut is the only source of sugar in your diet, you might go overboard. Too much sugar can lead to obesity, diabetes, heart disease, insulin resistance and metabolic problems. A 2017 article published in the journal Progress in Cardiovascular Diseases indicates that high-sugar diets raise blood pressure and blood glucose levels, trigger inflammation and elevate triglycerides. In the long run, they may induce leptin and insulin resistance, high cholesterol and impaired glucose tolerance. These are all major risk factors for heart disease. The same article points out that those who consume sugar regularly are three times more likely to die from this condition. High in calories and sugar, doughnuts may contribute to cancer. As a 2013 review published in the Journal of Obesity notes, about 20 percent of all cancer cases are related to obesity and poor nutrition. If your diet is rich in sugar, you'll eventually gain weight unless you burn those calories. This may lead to obesity, insulin resistance and even cancer. Unfortunately, sugar isn't the only harmful ingredient in doughnuts. These treats also contain synthetic flavors, additives, preservatives and trans fats. Dunkin' Donuts, for instance, decided to remove artificial dyes from their recipes. However, there are still more than 30 ingredients in a simple glazed doughnut. Besides milk, eggs, yeast, water and other traditional ingredients, their doughnuts contain palm and soybean oil, dextrose, artificial flavors, wheat starch and more. Soybean oil, for example, is high in saturated and trans fats. According to a 2015 study published in PLOS ONE, this popular ingredient is more likely to cause obesity and diabetes than fructose and coconut oil. Furthermore, it's been shown to activate the genes associated with cancer, inflammation, diabetes and mitochondrial dysfunction. What About the Doughnut Diet? Considering these risks, it's fair to say that doughnuts are among the worst foods for your body. Yet, some nutritionists recommend the so-called doughnut diet to emotional eaters. In fact, there's an entire website dedicated to this weight-loss plan. It's important to note that the doughnut diet isn't actually based on doughnuts. Think of it as a form of flexible dieting. You may eat doughnuts if you wish, but it’s not mandatory. The whole point is to give yourself permission to enjoy a favorite food so you can break free from emotional eating. Moderation is the key. Dieters are only allowed to have one serving of doughnuts or other treats. No matter how good it sounds, the doughnut diet lacks scientific evidence. Eating donuts occasionally is unlikely to cause weight gain or make you sick — just make sure you don't make a habit of it. Watch your portions and try to choose low-sugar versions. You may think that eating doughnuts for breakfast is pretty safe since you’ll burn those calories throughout the day. Not really, because it's not all about calories. According to Medical News Today, some people experience the so-called Somogyi effect and the dawn phenomenon. Both conditions cause their blood sugar levels to be high in the morning. Doughnuts are rich in carbs. If your blood sugar levels are already high when you wake up, eating doughnuts will further elevate them. This may lead to hyperglycemia. In the long run, it may increase your risk of insulin resistance, which is a risk factor for heart disease, metabolic syndrome and obesity, as a 2017 study published in The Faseb Journal points out. Limiting carbs in the morning while on a Mediterranean diet may lead to a greater reduction in body fat levels, body mass index (BMI) and waist circumference. If you skip carbs for breakfast, you may experience more noticeable improvements in fat mass and body weight compared to following the same diet without limiting carbs in the morning. Read more: Should You Eat Carbs or Protein in the Morning on a Diet? At the end of the day, it all comes down to your overall diet and eating habits. If you have a healthy diet, indulging in doughnuts once in a while won't make any difference. Remember that there are better options to choose from. Fresh and dried fruits, almonds, walnuts, cashews and pumpkin seeds are a lot healthier. Plus, you can always make doughnuts at home using stevia, honey, whole wheat or almond flour, dark chocolate and other nutritious ingredients.